Galaxy A20 is a new addition to the Samsung Galaxy A series. This makes it a fourth member to the already launched Galaxy A10, Galaxy A30 and Galaxy A50 smartphones. Samsung Galaxy A20 price in India starts from Rs.12,490 with some amazing specs and features. Talking about Galaxy A20 specifications, it comes with Exynos 7885 soc with a dual-core 2.2 GHz & hexa-core 1.8 GHz processor. The device features a full HD 6.4 inches of Infinity-V Display with 720 x 1560 pixels of resolution. You will find detailed Galaxy A20 review on the internet with mixed opinions from different users. Furthermore, the Galaxy A20 mobile sports 32 GB of internal memory with 3 GB of RAM. Moreover, it also features an amazing dual camera setup of 13+5 megapixel on the back. Whereas, on the front, it sports a 8 megapixel shooter for selfies. As far as the battery is concerned, it has non-removable Li-Ion 4000 mAh battery. On the contrary, Samsung Galaxy A20 launch date in India and worldwide was April 2019. You can buy Galaxy A20 on sale from 8th April 2019 via the Samsung online store. With such specs, there is no doubt that Samsung Galaxy A20 will give tough competition to Redmi Note 7 and Realme U1 smartphones. In this guide, we will download and install latest official Android 9 Pie Stock firmware on Samsung Galaxy A20 SM-A205F. This firmware is based on Android version 9 Pie with build number A205FXXU1ASC3. 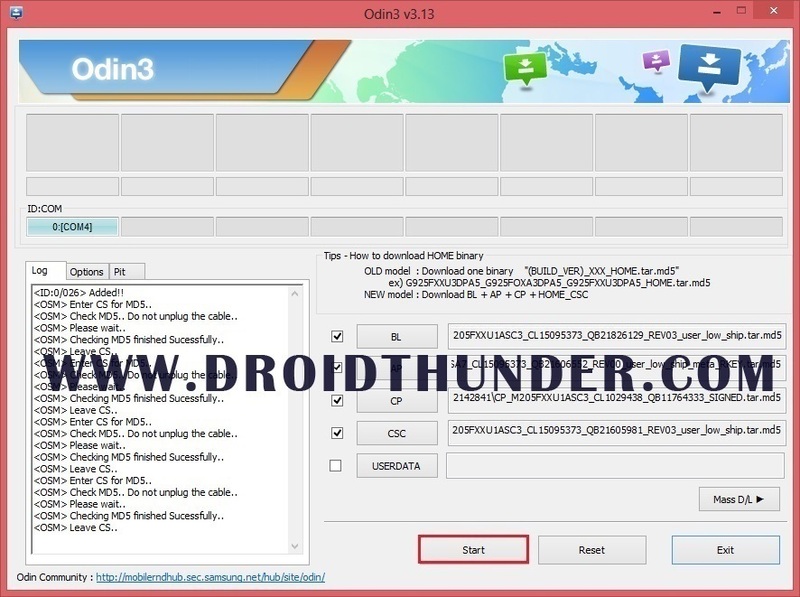 We will use Odin3-v3.13.1 flash tool to manually install this Pie ROM file on computer. Note that this is an Indian OTA update with April 2019 security patch. If you have rooted Galaxy A20, or installed custom ROM on Galaxy A20, then you can restore or go back to Stock ROM using this tutorial. Process mentioned below is risky. We at Droid Thunder will not be held liable for any damage caused to your device by referring this guide. Furthermore, the Samsung firmware used is property of their respective owners. Flash this software update only on Samsung Galaxy A20 having model number SM-A205F. If you try to install this update on any other device or variant, then it might brick your phone. Therefore, confirm your device model number before moving ahead. To avoid any interruption, it is recommended to charge your device at least 50%. This firmware flashing process will wipe out your phone data and settings completely. Hence, take backup of contacts, apps, messages, call logs, notes etc. Install Samsung USB drivers on your computer so as to detect the phone when connected using USB cable. Download Samsung Galaxy A20 USB Drivers. (Optional) Temporary disable all the security tools as well as antivirus on your PC. Step 1: Download Android 9 Pie firmware. Step 2: Extract the INS-A205FXXU1ASC3.zip firmware file on your PC. Step 3: Switch off your mobile completely until it vibrates. 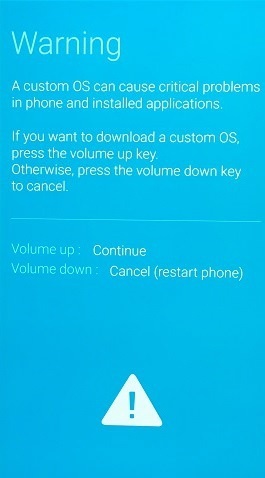 Step 4: Boot your phone into downloading mode. For that, press and hold Volume Down key + Power Button simultaneously. Leave both the keys as soon as you see the following warning message. Step 5: Simply press Volume Up button to continue. This is how you can boot Samsung Galaxy A20 into download mode. Step 6: With USB cable, connect your device to PC. 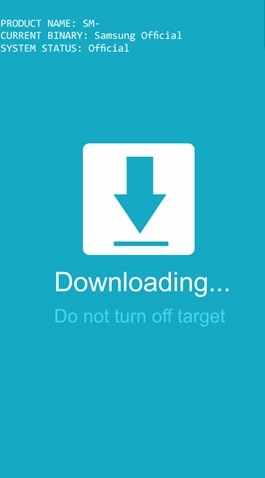 Step 8: Open the ‘Odin Multi Downloader3-v3.13.1′ tool. Verify whether the ID: COM section in Odin flash tool is turned light blue or not. Also verify if an Added message is shown in the message box window or not. Note: If such thing doesn’t happen then it’s problem with mobile drivers. So re-install Samsung USB drivers from the links given above. If the problem persists, try changing USB cable or USB port. Step 9: Check Auto Reboot and F.Reset Time options. Keep rest of the options as they are. Step 10: Click on BL button present on Odin and select ‘BL’ file from the extracted firmware package. Step 11: Similarly click on CP button and select ‘CP’ file from the firmware package. Step 12: Next click on CSC button and open firmware file with ‘HOME_CSC’ in its name. Note: HOME_CSC contains instruction that allows Odin to only wipe cache while Normal CSC contains an instruction to wipe out complete data. But when a downgrade is done (example: from Pie back to Nougat) a factory reset is must. So use normal CSC at that time. Step 13: Finally click on AP button and select ‘AP’ file from the firmware package. Note: The AP file will take little time to load. So do not panic. Step 14: We will begin the process now. Hence, press Start button present on the Odin flash tool. This will start the actual Android 9.0 Pie firmware flashing process. Note: Your mobile will restart automatically. Do not disconnect it from computer. As soon as the flashing finishes, the ID: COM section will show a Pass message as shown below. This will confirm that your Samsung Galaxy A20 SM-A205F is successfully upgraded to official Android 9 Pie A205FXXU1ASC3 firmware. Note: If Odin fails to install this software update on your Samsung device, then close Odin tool, again boot into download mode and repeat every step again. Finally! The official Android 9.0 Pie XXU1ASC3 stock firmware update is successfully flashed on Samsung Galaxy A20 SM-A205F smartphone. Go to Menu->Settings->About Phone and confirm the same. If you come across any difficulty, please comment below.